Wellesley is grateful for the long tradition of alumnae giving back to their alma mater with devotion and generosity. Indeed, Wellesley’s leadership in higher education depends on the collective generosity of alumnae. Gifts of any size have a value beyond their dollar figure, as a high participation rate —determined by the number of alumnae who make a donation to the College during a given fiscal year—says a great deal about the College. A high alumnae participation rate sends a strong message to prospective students and faculty that Wellesley has a vibrant and committed alumnae and donor network. It's a proof point to the oft-made statement that "other people go to college for four years; with Wellesley it's for life!" To attract the very best, we need to demonstrate how Wellesley excels. Alumnae participation rates factor into rankings, like those in U.S. News & World Report. While such rankings are not an exact measure of anything, they are reviewed by prospective parents and students, and they may impact the value of a Wellesley degree years after graduation. Additionally, before corporations and foundations make grants to Wellesley, they ask about alumnae participation rates. They want to see that alumnae support their undergraduate institution before they invest. Finally, and most directly, the more donors who give, the more money Wellesley can use to fund financial aid packages and scholarships for current students. When all gifts join together they provide each student with the second-to-none Wellesley experience every year. Given all these points, participating in giving back to Wellesley may be the easiest way for alumnae to be "women who will make a difference in world." This year, the College is determined to reach its 50 percent alumnae participation goal. The amount of the gift does not matter. Simply making a donation of any size will help Wellesley in achieving this ambitious feat. A handful of U.S. colleges record alumni participation rates of 50 percent and higher. Wellesley deserves a seat at this table. As the premier liberal arts college for women, we should lead the way in this as in so much else! If you are a Wellesley alum and have not made a donation to Wellesley since June 30, 2013, your support now can have an even greater impact. 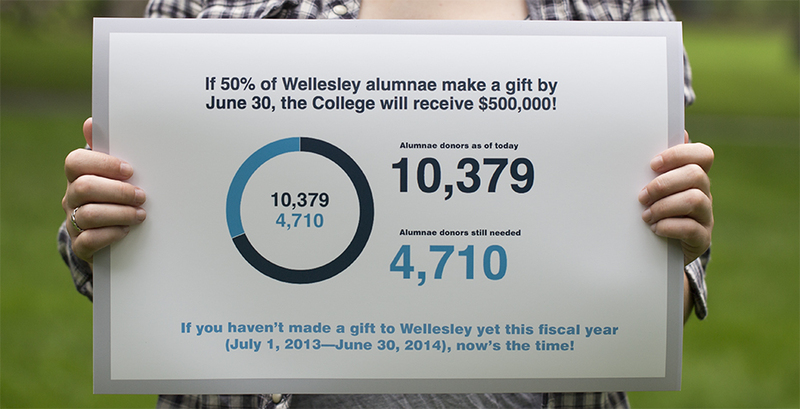 On June 1, Wellesley launched its giving challenge titled 50% = $500,000. If Wellesley reaches its 50 percent participation goal by June 30, the College will receive an additional $500,000. This is a tremendous opportunity; one that will allow Wellesley to put the additional funds toward supporting today’s and tomorrow’s students. Visit www.wellesley.edu/50for500k for more details.